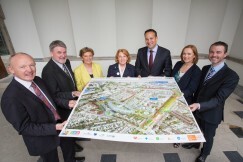 Latest designs for the new children’s hospital are shared. Significant Improvements in clinical outcomes for complex cases can be expected when all services are delivered under one roof. Opportunities to expand on clinical synergies with St. James’s Hospital and to strengthen research ties will enhance the overall care provided to children, young people and families. The National Paediatric Hospital Development Board (NPHDB) today shared the latest designs for the new children’s hospital with members of the Oireachtas and with residents in the local Dublin 8 community. These meetings build on the extensive engagement that has taken place in recent weeks with patient advocacy groups, existing children’s hospital staff, families and the national Youth Advisory Committee.